1. Department of Physical Medicine and Rehabilitation, Taichung Tzu Chi Hospital, Buddhist Tzu Chi Medical Foundation, Taichung City 427, Taiwan. 2. Department of Physical Medicine and Rehabilitation, School of Medicine, Tzu Chi University, Hualien 970, Taiwan. 3. Graduate Institute of Sports Science, National Taiwan Sport University, Taoyuan 33301, Taiwan. 5. Graduate Institute of Metabolism and Obesity Sciences, Taipei Medical University, Taipei 11031, Taiwan. Current treatment options for muscle injuries remain suboptimal and often result in delayed/incomplete recovery of damaged muscles. In this study, the effects of dextrose prolotherapy on inflammation and regeneration of skeletal muscles after a contusion injury were investigated. 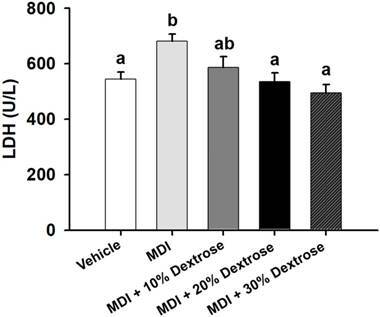 Mice were separated into five groups, including a normal control (NC), post-injury with no treatment (mass-drop injury, MDI), post-injury with 10% dextrose (MDI + 10% dextrose), post-injury with 20% dextrose (MDI + 20% dextrose), and post-injury with 30% dextrose (MDI + 30% dextrose). The gastrocnemius muscles of the mice were subjected to an MDI, and muscle samples were collected at 7 days post-injury. Results showed the serum creatine kinase (CK), blood urea nitrogen (BUN), creatinine (CREA), and low-density lipoprotein (LDH) of the MDI-alone group were significantly higher than those of the normal control group (p<0.05). However, levels of serum CK, BUN, CREA, and lactate dehydrogenase (LDH) significantly decreased with different concentrations of dextrose. In addition, dextrose suppressed the macrophage response (F4/80 protein decreased) and promoted muscle satellite cell regeneration (desmin protein increased). In conclusion, dextrose prolotherapy can effectively help repair muscles; therefore, it may be one of the methods for clinically treating muscle injuries. Keywords: dextrose, prolotherapy, contusion, mass-drop injury (MDI), diclofenac (DCF). Among sports injuries, up to 35%~55% are soft-tissue injuries . Soft-tissue injuries can cause significant pain, swelling, and bruising to the affected muscle, ultimately leading to delayed and impaired functionality . The pathophysiology of muscle injuries includes a series of complex stages which may occur simultaneously, including degeneration, inflammation, regeneration, and the formation of fibrotic scar tissue [3-6]. Depending on the intensity of the injury, damages to skeletal muscle may also be accompanied by capillary rupture, infiltrative bleeding, inflammation, oxidative stress, and fibrosis. Inflammation plays a key role in these processes, since inflammatory cytokines mediate the cellular environment, which largely controls the progress of other repair processes. Therefore, inflammation seems the best target for developing effective treatments for faster repair. Recent research focused on modulating inflammation to improve muscle regeneration, for example, by targeting immune cells activated during the inflammatory phase [7,8]. During inflammation, chemotactic signals draw neutrophils and macrophages to the site of injury for phagocytosis [5,9,10]. Neutrophils, macrophages, and satellite cells damage the surrounding tissues unaffected by the primary injury by producing reactive oxygen species, resulting in oxidative stress, and causing secondary muscle damage. Despite the fact that macrophages in the early stage may participate in sustaining the inflammatory response and contribute to secondary damage, these cells also release various growth factors which directly accelerate tissue repair and regeneration [5,11]. In addition, both neutrophils and macrophages stimulate T cells to secrete cytokines such as interleukin (IL)-1, IL-6, and IL-8 as well as other chemotactic factors, and recruit satellite cells, fostering a greater capacity for muscle regeneration [5,12,13]. Therefore, it could be concluded that although inflammation is conducive to secondary damage, it is also a critical factor in repairing muscle cells after an injury. This is also the reason why when the inflammatory response is severely blocked for a prolonged period of time, for example, by non-steroidal anti-inflammatory drug (NSAID) treatment, it might not result in successful clinical outcomes, due to delayed and/or incomplete tissue healing and excessive scar formation, which increase the risk of injury recurrence. Bertrand et al. found that injection with hypertonic dextrose in patients with painful rotator cuff tendinopathy on painful entheses resulted in better long-term pain improvement and patient satisfaction than did an injection of saline, and results of enthesis injections were intermediate. While the regenerative effect could not account for such differences, dextrose prolotherapy may improve standard care for painful rotator cuff tendinopathy in certain patients. Lee et al. showed that prolotherapy can improve the pain, disability, isometric strength, and shoulder acute rupture of membranes (AROM) in patients with refractory chronic rotator cuff disease. Therefore, dextrose prolotherapy may be a potential candidate for further development as an effective treatment for clinical use to repair muscles after sterile contusion injury. Nevertheless, as far as we know, dextrose prolotherapy for contusion-induced muscle injuries in mice remains unreported. In this study, we evaluated the effects of dextrose prolotherapy on contusion-induced muscle injuries in mice by investigating the serum lactate dehydrogenase (LDH) and creatine kinase (CK) as well as the expressions of F4/80 and desmin after muscle injuries. Male ICR mice (8 weeks old; 30~40 g) were purchased from BioLASCO (A Charles River Licensee, Yi-Lan, Taiwan). Experimental animals were given 1 week to acclimatize to the environment and diet. All animals were fed a chow diet (no. 5001; PMI Nutrition International, Brentwood, MO, USA) and distilled water ad libitum, and were maintained on a regular cycle (12-h light/dark) at room temperature (24±2 °C) and 60%~70% humidity. The bedding was changed and cleaned twice a week. All animal experimental protocols were approved by the Institutional Animal Care and Use Committee (IACUC) of National Taiwan Sports University, and the study conformed to guidelines of protocol IACUC-10505-M approved by the IACUC ethics committee. As shown in Fig. 1A, 48 mice were randomly assigned to six groups (8 mice/group), namely: (1) a normal control (NC), animals injected with saline with no injury; (2) mass-drop injury (MDI), animals injected with saline at 2 h post-injury; (3) MDI + 10% dextrose, animals injected with 10% dextrose at 2 h post-injury; (4) MDI + 20% dextrose, animals injected with 20% dextrose at 2 h post-injury; (5) MDI + 30% dextrose, animals injected with 30% dextrose at 2 h post-injury; and (6) MDI + DCF (diclofenac, an NSAID), animals injected with DCF at 2 h post-injury. On day 7 after injury at the end of the experiment, mice were sacrificed. Serum was collected by centrifugation at 1500 ×g and 4 °C for 10 min. The liver, muscles, lungs, kidneys, heart, and epididymal fat pad tissues were collected and weighed. Muscle tissues were snap-frozen and stored at -80 °C until further analysis. Contusion injury to a mouse hind-limb was produced using a mass-drop injury method as described in a previous study  with slightly modification. Briefly, the technique entails dropping a 50-g weight from a height of 60 cm onto the medial surface of the left gastrocnemius muscle after exposure to 4%~5% isoflurane (Fig. 1B). This contusion injury had a medium intensity and did not cause bone injury or gait abnormalities in the MDI groups. At the end of the experiments, after an 8-h fast, mice were sacrificed by 95% CO2 asphyxiation, and blood was withdrawn by cardiac puncture. Serum was collected by centrifugation, and levels of blood urine nitrogen (BUN), creatinine (CREA), lactate dehydrogenase (LDH), and creatine kinase (CK) were assessed as our previous study . The liver, muscles, lungs, kidneys, heart, and fat tissues were removed at the end of the experiment, and fixed in 10% neutral buffered formalin for 24 h before being processed for a histopathologic analysis as we previously described . Tissues were embedded in paraffin and cut into 4-μm-thick slices for morphological and pathological evaluation, then stained with hematoxylin and eosin (H&E) and examined with a light microscope equipped with a CCD camera (BX-51, Olympus, Tokyo, Japan). For IHC, paraffin-embedded samples were cut into 5-μm-thick sections, deparaffinized, and rehydrated through an alcohol-to-water gradient, and then treated with boiling water for 15 min. Sections were incubated in 3% hydrogen peroxide for 10 min to block endogenous peroxidase activity and then incubated overnight at 4 °C with the primary rabbit monoclonal antibody, F4/80 (MA5-16363; Thermo Scientific, Waltham, MA, USA), working dilution 1:100 and the rabbit polyclonal antibody, desmin (SC-14026; Santa Cruz Biotechnology, Santa Cruz, CA, USA), working dilution 1:25. For antigen retrieval, the sections were immunostained with the VECTASTAIN® ABC kit (UNIVERSAL, VECTOR, USA) in accordance with the manufacturer's specifications. Diaminobenzidine (DAB) was used for staining development, and sections were counterstained with hematoxylin. In the negative controls, normal serum was substituted for the primary antibodies. (A) The schedule of dextrose prolotherapy treatment for contusion-induced muscle injuries in mice. (B) The gastrocnemius muscle of mice was subjected to a mass-drop injury (MDI). Mice were randomly assigned to six groups (8 mice/group), namely: (1) normal control (NC), animals injected with saline without injury; (2) MDI, animals injected with saline at 2 h post-injury; (3) MDI + 10% dextrose, animals injected with 10% dextrose at 2 h post-injury; (4) MDI + 20% dextrose, animals injected with 20% dextrose at 2 h post-injury; (5) MDI + 30% dextrose, animals injected with 30% dextrose at 2 h post-injury; and (6) MDI + DCF (diclofenac, an NSAID), animals administrated DCF at 2 h post-injury. All results are expressed as the mean±standard error of the mean (SEM) (n = 8). The significance of the difference was calculated by a one-way analysis of variance (ANOVA) with Duncan's post-hoc test, and values of < 0.05 were considered significant. Results of the one-way ANOVA indicated that there were no significant differences in body weight, food intake, liver mass, muscle mass, lung mass, kidney mass, heart mass, or epididymal fat pad mass of mice in the MDI + 10% dextrose, MDI + 20% dextrose, and MDI + 30% dextrose groups compared to the MDI group. Effect of dextrose prolotherapy on serum blood urea nitrogen (BUN) on contusion-induced muscle injuries in mice. Mice were randomly assigned to five groups (8 mice/group), namely: (1) normal control (NC), animals injected with saline without injury; (2) mass-drop injury (MDI), animals injected with saline at 2 h post-injury; (3) MDI + 10% dextrose, animals injected with 10% dextrose at 2 h post-injury; (4) MDI + 20% dextrose, animals injected with 20% dextrose at 2 h post-injury; and (5) MDI + 30% dextrose, animals injected with 30% dextrose at 2 h post-injury. Data are the mean±SEM (n = 8 mice/group). Different letters indicate a significant difference at p<0.05 by a one-way ANOVA. Effect of dextrose prolotherapy on serum creatinine (CREA) on contusion-induced muscle injuries in mice. Mice were randomly assigned to five groups (8 mice/group), namely: (1) normal control (NC), animals injected with saline without injury; (2) mass-drop injury (MDI), animals injected with saline at 2 h post-injury; (3) MDI + 10% dextrose, animals injected with 10% dextrose at 2 h post-injury; (4) MDI + 20% dextrose, animals injected with 20% dextrose at 2 h post-injury; and (5) MDI + 30% dextrose, animals injected with 30% dextrose at 2 h post-injury. Data are the mean±SEM (n = 8 mice/group). Different letters indicate a significant difference at p<0.05 by a one-way ANOVA. In vehicle control mice, the serum BUN level was 21.2 ± 0.8 mg/dL. In animals with a contusion-induced muscle injuries, the serum BUN level was elevated to 26.1 ± 1.5 mg/dL. Therefore, the serum BUN level showed an increase of 23.3% compared to the vehicle control (p<0.05). As shown in Fig. 2, serum BUN levels of the MDI + 10% dextrose (20.7±0.7 mg/dL), MDI + 20% dextrose (18.8±0.5 mg/dL), and MDI + 30% dextrose (18.9±0.3 mg/dL) groups were significantly lower compared to the MDI-alone group (26.1 ± 1.5 mg/dL) (p<0.05). Therefore, mice injected with 10%, 20%, and 30% dextrose after injury had significantly lower serum BUN levels by 20.6%, 27.9%, and 27.5%, respectively, than the MDI-alone group. But, there was no significant dose-dependent effect on the serum BUN level. Compared to vehicle control mice (0.23±0.02 mg/dL), the serum CREA level of the MDI-alone group (0.27±0.02 mg/dL) significantly increased by 21.0% (p<0.05) (Fig. 3). Serum CREA of the MDI + 10% dextrose group was 0.21±0.01 mg/dL (23.7% lower than that of the MDI-alone group, p<0.05); serum CREA of the MDI + 20% dextrose group was 0.15±0.01 mg/dL (46.6% lower than that of the MDI-alone group, p<0.05); and serum CREA of the MDI + 30% dextrose group was 0.13±0.01 mg/dL (53.9% lower than that of the MDI-alone group, p<0.05). There was a significant dose-dependent effect on the serum CREA level (p<0.05). Therefore, animals injected with 10%, 20%, and 30% dextrose had significantly reduced serum CREA. Although LDH is abundant in tissue cells, blood levels of the enzyme are normally low. However, when tissues are damaged by injury, they release more LDH into the bloodstream. Thus, serum LDH is known to serve as an accurate indicator of muscle trauma. As shown in Fig. 4, the serum LDH level of the MDI-alone group (681±26 U/L) showed an increase of 25.1% compared to the vehicle control group (544±26 U/L) (p<0.05). However, animals injected with 10%, 20%, and 30% dextrose showed significant reductions in serum LDH by 13.9%, 21.5%, and 27.4%, respectively, compared to the MDI-alone group (p<0.05). Results showed that dextrose prolotherapy reduced serum LDH levels due to contusion-induced muscle injuries in mice. A contusion can cause physical damage, and then lead to sarcomeric damage and muscular cell necrosis . Muscle cells release CK into the blood indicating that muscle damage has occurred or is occurring. Clinically, CK is known to serve as an accurate indicator of muscle damage. As shown in Fig. 5, the serum CK level of the MDI-alone group (1586±229 U/L) showed an increase of 239.5% compared to the vehicle control (467±48 U/L) (p<0.05). However, serum CK levels of the MDI + 10% dextrose (959±144 U/L), MDI + 20% dextrose (908±91 U/L), and MDI + 30% dextrose (1003±116 U/L) groups decreased compared to the MDI-alone group (1586±229 U/L). Thus, animals injected with 10%, 20%, and 30% dextrose showed significant reductions in serum CK by 39.6%, 42.8%, and 36.7%, respectively, compared to the MDI-alone group (p<0.05). In this study, dextrose prolotherapy reduced serum CK levels in mice with contusion-induced muscle injuries. Effect of dextrose prolotherapy on serum lactate dehydrogenase (LDH) on contusion-induced muscle injuries in mice. Mice were randomly assigned to five groups (8 mice/group), namely: (1) normal control (NC), animals injected with saline without injury; (2) mass-drop injury (MDI), animals injected with saline at 2 h post-injury; (3) MDI + 10% dextrose, animals injected with 10% dextrose at 2 h post-injury; (4) MDI + 20% dextrose, animals injected with 20% dextrose at 2 h post-injury; and (5) MDI + 30% dextrose, animals injected with 30% dextrose at 2 h post-injury. Data are the mean±SEM (n = 8 mice/group). Different letters indicate a significant difference at p<0.05 by a one-way ANOVA. As shown in Fig. 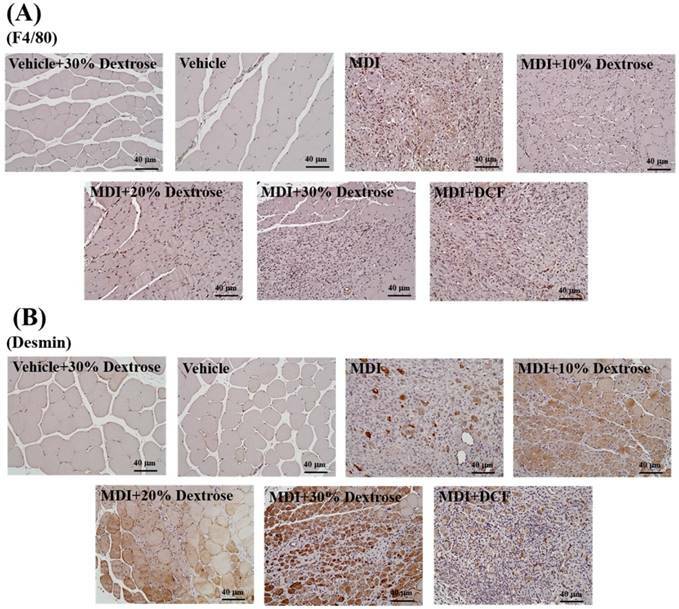 6, groups did not differ in histological observations of the liver, lungs, kidneys, heart, or fat tissues of mice in the MDI, MDI + 10% dextrose, MDI + 20% dextrose, MDI + 30% dextrose, and MCD + DCF groups compared to the vehicle control group. Figure 6 shows the therapeutic effect of dextrose prolotherapy against contusion-induced muscle injuries using H&E staining. Histological evaluation of muscle tissues showed that the blunt force to the muscle markedly disrupted and damaged the muscle fibers, resulting in red blood cell accumulation in the interstitial spaces after contusion-induced muscle injuries in mice. However, injection of dextrose and DCF could recover disruption of the muscle tissues in contusion-induced muscle injuries. Among four treatments, 10% dextrose exhibited the best recovery effect, and the therapeutic effect of 10% dextrose was better than that of DCF (the positive control). Effect of dextrose prolotherapy on serum creatine kinase (CK) on contusion-induced muscle injuries in mice. Mice were randomly assigned to five groups (8 mice/group), namely: (1) normal control (NC), animals injected with saline without injury; (2) mass-drop injury (MDI), animals injected with saline at 2 h post-injury; (3) MDI + 10% dextrose, animals injected with 10% dextrose at 2 h post-injury; (4) MDI + 20% dextrose, animals injected with 20% dextrose at 2 h post-injury; and (5) MDI + 30% dextrose, animals injected with 30% dextrose at 2 h post-injury. Data are the mean±SEM (n = 8 mice/group). Different letters indicate a significant difference at p<0.05 by a one-way ANOVA. The indicator desmin was used to evaluate the regeneration of muscle satellite cells. As shown in Fig. 7A, desmin protein expression of the MDI-alone group showed an increase compared to the vehicle control. 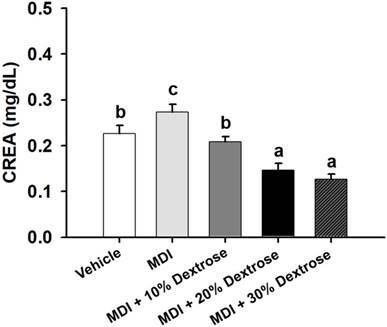 In addition, animals injected with 10%, 20%, and 30% dextrose showed significant increases in desmin protein expression compared to the MDI-alone group. The data indicate that dextrose prolotherapy resulted in more-effective muscle repair after contusion-induced muscle injuries. These results indicate that a dextrose injection can elevate desmin expression with a contusion, which in turn can promote the regeneration of muscle satellite cells. George et al. found that desmin expression steadily increased after injury, with the highest values at 7 days after injury. In this study, desmin expression also increased for 7 days after the contusion. George et al. showed that Prosopis glandulosa significantly elevated desmin expression, thereby facilitating more-effective muscle recovery. Thus, in this study, dextrose prolotherapy elevated desmin expression, thereby promoting muscle recovery in contusion-induced muscle injuries. 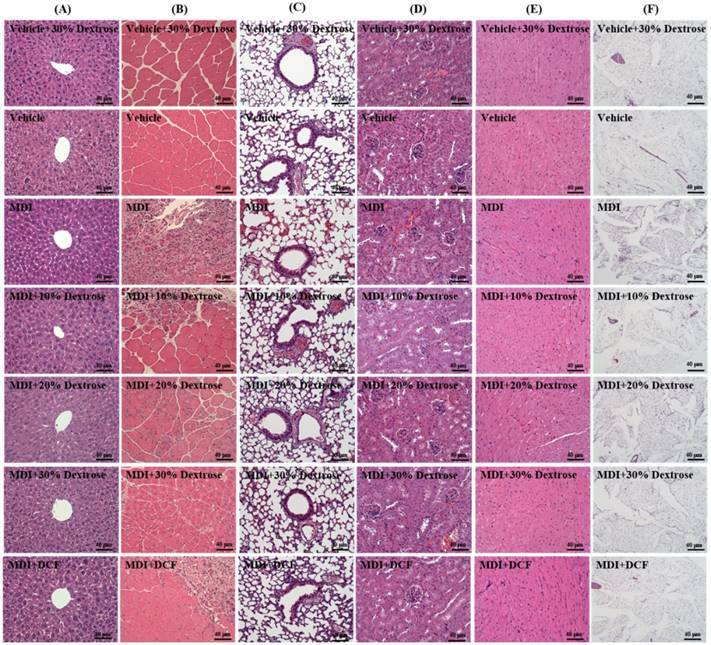 Effects of dextrose prolotherapy on pathological histology of (A) the liver, (B) muscles, (C) lungs, (D) kidneys, (E) heart, and (F) epididymal fat pad tissues on contusion-induced muscle injuries in mice. Mice were randomly assigned to seven groups (8 mice/group), namely: (1) vehicle + 30% dextrose, animals injected with 30% dextrose without injury; (2) vehicle control, animals injected with saline without injury; (3) mass-drop injury (MDI), animals injected with saline at 2 h post-injury; (4) MDI + 10% dextrose, animals injected with 10% dextrose at 2 h post-injury; (5) MDI + 20% dextrose, animals injected with 20% dextrose at 2 h post-injury; (6) MDI + 30% dextrose, animals injected with 30% dextrose at 2 h post-injury; and (7) MDI + DCF (diclofenac, an NSAID), animals administrated DCF at 2 h post-injury. The indicator F4/80 was used to evaluate macrophage infiltration. As shown in Fig. 7B, the muscle tissue distribution of the murine macrophage-specific antigen, F4/80, was assessed using IHC. F4/80 protein expression of the MDI-alone group showed an increase compared to the vehicle control. 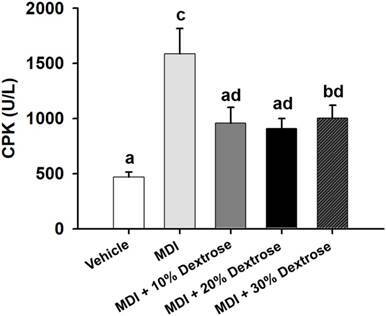 However, animals injected with 10%, 20%, and 30% dextrose exhibited reduced F4/80 protein expressions compared to the MDI-alone group. In addition, F4/80 protein expressions with 10%, 20%, and 30% dextrose were less than that with DCF. Furthermore, 10% dextrose produced the most obvious decrease in F4/80 protein expression among the four treatments. Data indicate that dextrose prolotherapy resulted in more-effective muscle repair after a contusion than the NSAID, DCF. 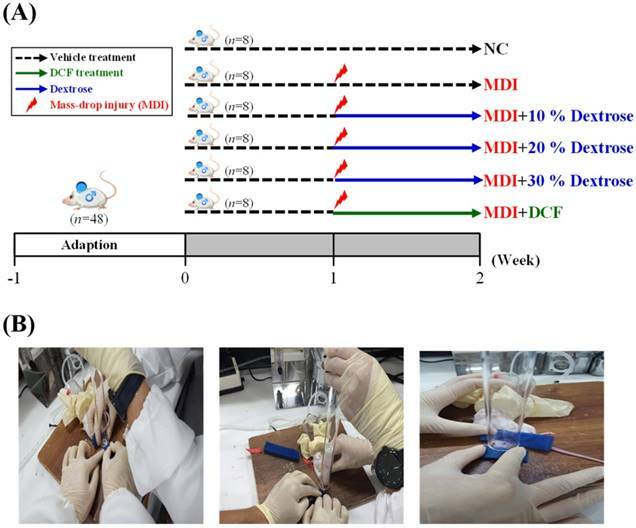 These results indicate that mice with a contusion-induced muscle injuries injected with dextrose prolotherapy exhibited decreased F4/80 protein expression compared to the MDI-alone group; so dextrose prolotherapy could decrease macrophages in the repair of muscle after contusion-induced muscle injuries. Proliferative therapy has become established worldwide since the 1930s. In a clinical trial, Dr. Hackett found that the main cause of musculoskeletal pain may be ligament injuries, and thus developed prolotherapy which included an injection of autologous platelet extraction and high-concentration glucose [20,21]. In the past 2 years, hyperplasia therapy has been continually applied for clinical implementation in rehabilitation departments in Taiwan. High-concentration glucose water was proven to be effective in clinical outcomes [14,15,22], but the mechanism of dextrose prolotherapy on contusions remains unclear. Therefore, we investigated the effects of dextrose prolotherapy on contusion-induced muscle injuries in a murine model. During contusion injury, myocytes and other surrounding cells release chemotactic factors, which causes immune cells to be attracted and move to the site of damage [3,9,23]. In this study, we proposed that dextrose prolotherapy is a potential candidate for treating contusion injuries. We assessed the effects of macrophages infiltrating into the injured area, and their influence on the situation of regeneration. We found that dextrose was associated with restraining the response of macrophages to contusion injury. IHC staining of (A) F4/80 protein and (B) desmin protein in muscle tissues after contusion-induced muscle injuries in mice. Mice were randomly assigned to seven groups (8 mice/group), namely: (1) vehicle + 30% dextrose, animals injected with 30% dextrose without injury; (2) vehicle control, animals injected with saline without injury; (3) mass-drop injury (MDI), animals injected with saline at 2 h post-injury; (4) MDI + 10% dextrose, animals injected with 10% dextrose at 2 h post-injury; (5) MDI + 20% dextrose, animals injected with 20% dextrose at 2 h post-injury; (6) MDI + 30% dextrose, animals injected with 30% dextrose at 2 h post-injury; and (7) MDI + DCF (diclofenac, an NSAID), animals administrated DCF at 2 h post-injury. Nevertheless, dextrose prolotherapy actually facilitated more-effective muscle recovery with increased F4/80 expression in muscle cells, while it decreased the infiltration of macrophages during the process of muscle repair after contusion-induced muscle injuries (Fig. 7B). Inflammatory cells which infiltrated into the injured muscle, as well as the satellite cells, appear to be the most crucial to successful regeneration. Among these inflammatory cells, monocytes/macrophages play key roles in this repair process. These cells responded to local vascular damage, and molecules released by degenerating myofibers extravasated from the blood and infiltrated into injured areas, to phagocytose myofiber debris. In addition to this critical function, inflammatory cells also produce growth factors, cytokines, inflammatory mediators, and damage signals that deeply affect the state of satellite cells during the repair process . Along with monocyte/macrophage recruitment, resting satellite cells are activated by damage/inflammation-associated signals and begin to proliferate, supplying enough myonuclei for the formation of new myofibers. As shown in Fig. 7A, mice injected with 10%, 20%, and 30% dextrose showed significant increases in desmin protein expression compared to the MDI-alone group. 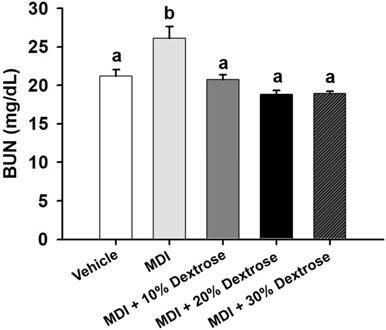 Therefore, these results reveal that dextrose can promote desmin expression in mice with contusion-induced muscle injuries by facilitating muscle satellite cell regeneration. Consistent with our other data, desmin expression significantly increased after dextrose treatment, inducing better conditions for muscle fiber repair. In contrast, desmin expression after NSAID treatment was significantly lower than with dextrose treatment, again implying an inhibitory ability of NSAID toward repair, as suggested in the literature . George et al. pointed out that the initial suppression of repair by NSAIDs can be overcome if NSAID administration is limited to 1~2 days post-injury, but it was proven that NSAID treatment should not be administered after these very early time points post-injury. In this study, dextrose prolotherapy suppressed the macrophage response (F4/80 protein decreased) and promoted muscle satellite cell regeneration (desmin protein increased) after contusion injury. In addition, dextrose prolotherapy decreased serum LDH and CK levels by improving muscle damage after contusion-induced muscle injuries in mice. Thus, dextrose prolotherapy facilitated effective muscle recovery after contusion-induced muscle injuries. The present results suggested that injection with 10% dextrose once after contusion-induced muscle injuries showed a better therapeutic effect than 20% dextrose, 30% dextrose, and DCF. Therefore, these results showed that 10% dextrose has great potential for more-effective muscle repair after sterile contusion injury. This research was supported by the Ministry of Science and Technology of Taiwan (grant no. MOST 105-2314-B-303-004 to Sen-Wei Tsai and MOST 106-2313-B-038-003-MY2 to Yu-Tang Tung), and institutional grants to Dr. Tsai (Taichung Tzu Chi Hospital, Buddhist Tzu Chi Medical Foundation) and to Dr. Tung (grant no. TMU106-AE1-B15, Taipei Medical University). The authors are grateful to Dr. Chien-Chao Chiu for technical assistance with animal experiments. Sen-Wei Tsai, Chi-Chang Huang, and Yu-Tang Tung designed the experiments. Sen-Wei Tsai, Yi-Ju Hsu, Chi-Chang Huang, and Yu-Tang Tung carried out the laboratory experiments. Sen-Wei Tsai, Hao-En Huang, and Yu-Tang Tung analyzed the data, interpreted the results, prepared the figures, and wrote the manuscript. Sen-Wei Tsai, Hao-En Huang, Chi-Chang Huang, and Yu-Tang Tung revised the manuscript. Sen-Wei Tsai, Chi-Chang Huang, and Yu-Tang Tung contributed reagents, materials, and analytical platforms.